Please check this website frequently for updates and other news. Please help support this website by making a donation of your choice. Members of the campaign to Save Our Lady of Loreto Church puts in their proposal. Click on the link below to read the proposal. reuse of the former Our Lady of Loreto Church building. Click on the link below to read the full proposal. 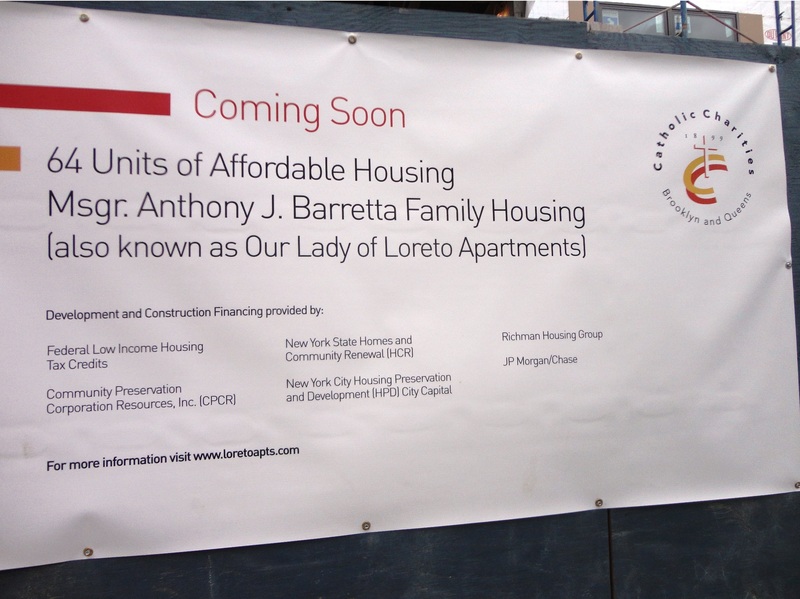 The Our Lady of Loreto Family Apartments are now open for applications. the saving of Our Lady of Loreto Church from being demolished. update in the very near future. "Father Sorrentino" Chapter of the Knights of Columbus of Our Lady of Loreto. meetings will be held at the Presentation OLL Church. This is the same Council that was formerly located on Pacific St.
will be based out of the OLL Cultural / Don Bosco Center. Temporary meetings will be held at Presentation/OLL Church on 1677 Saint Marks Ave.
in Brooklyn as we wait for the Don Bosco Center to be repaired. Membership dues is only $35.00 per year. You must register to read the article. Bishop DiMarzio has agreed to Save Our Lady of Loreto Church from being Demolished. The pressure received from many groups, individuals, community leaders, politicians, etc. have collectively convinced the Diocese to change their mind. We are grateful for his decision and expect him to keep his word. The Diocese of Brooklyn removes stained-glass windows from Our Lady of Loreto. Preservationist and Activist plea to Bishop DiMarzio on Youtube. Read the story in the New York Daily News. this building will be used by the local population as a community and a cultural arts center. Mulberry and Grand Streets in Little Italy in Manhattan. on Wednesday, February 24th at 6:00 PM. and for current updates on the campaign save Our Lady of Loreto. "Friends of East New York Reunion"
Sign up for the next"Friends of East New York Reunion"
click on the reunion page on the OLL website. You don't want to miss the next reunion. How much is Our Lady of Loreto property worth? Click on the link below to read the assessment. Our Lady of Loreto from being demolish and making it a New York Landmark. by our friends from Our Lady of Loretto. On October 20, 2007 a meeting was held at Our Lady of Loretto. Bishop DiMarzio was our guest speaker to discuss the future of our beloved church. Our Lady of Loretto with Presentation. The Financial Committees of both parishes will have several meetings in the coming months. Bishop DiMarzio will decided which church makes the most sense to remain open. Our Lady of Loretto has Don Bosco center and the rental properties as an advantage. However, Presentation church is self sufficient with enough parishioners to its advantage, putting Our Lady of Loretto in jeopardy. We cannot let them close our church without putting up a fight. This is our church. Our family and past generations put so much into our church that we must not let our church die in vain. Your cooperation and contribution to Our Lady of Loretto is greatly appreciated. The Memorial Mass on June 24, 2007 was very successful. Approximately 200 of our fellow parishioners attended the mass. The Church is showing signs of deterioration and neglect. help preserve Our Lady of Loretto. On behalf of Our Lady of Loretto and all parishioners, we thank you.